Although you may know that a employee is not coming back to work, and in effect have resigned, from information other staff members give you, it is important to follow the correct procedure when dealing with desertion. 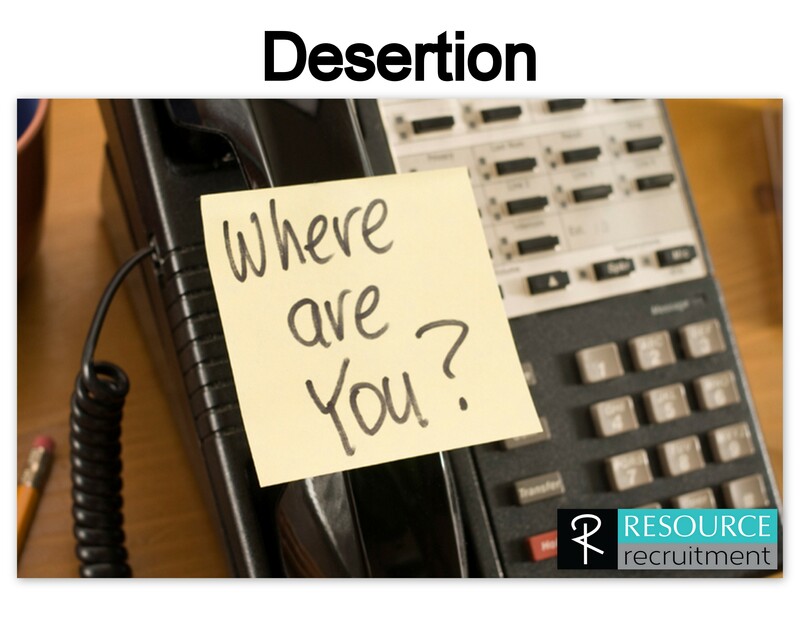 Desertion implies that an employee has left the place of work and does not appear to have any intention of returning to the workplace. HOW LONG DOES THE EMPLOYEE NEED TO BE OFF FOR IT TO BE DESERTION? Although the law does not state a specific period that an employee needs to be off, for it to be considered desertion, it is generally accepted that they should be off for longer than 5 days. If the employee does not contact the employer, the employer does have an obligation to try and contact the employee. The purpose of making contact with the employee is to determine of there is any reasonable explanation for the employee being off work, and to inform the employee of the possible consequences of not returning to work. WHAT HAPPENS IF THE EMPLOYEE DOES RETURN TO WORK? If the employee does return to work, after the agreed date, the employer can ask for reasons why they did not return to work when they were supposed to. Based on these reasons, the employer will then decide if any disciplinary action should be taken. WHAT IF THE EMPLOYEE DOES NOT RETURN TO WORK? If after all attempts to contact the employee, you are not successful, then you should continue with disciplinary procedures in the absence of the employee. WHAT HAPPENS IF THE EMPLOYEE RETURNS TO WORK AFTER THEY HAVE BEEN DISMISSED FOR DESERTION? If the employee returns to work after they have been dismissed, the employer is obliged to listen to the reasons the employee has for not being back at work on time, and not making contact with the company. Where the reason for not returning to work or contacting the employer are reasonable, (eg the employee was hospitalised), and especially if the employee has proof, the employer should consider re-employment. Even is a case were an employee admits desertion, they are still entitled to pay for any period worked, any leave pay owed etc. More information on this topic can be found on the CCMA website or in the Labour Relations Act, Schedule 8.